The Chrysler 300S has served as a premium luxury sport package over the past few years and with the introduction of the 2014 300S, the 300S package continues that route with some aesthetic changes inside and out. The pricing for the 2014 Chrysler 300S was not included in the release announcing the new black exterior and blue interior but we can expect it to be one of the more expensive models in the 300 lineup shy of the high performance 300C SRT8. 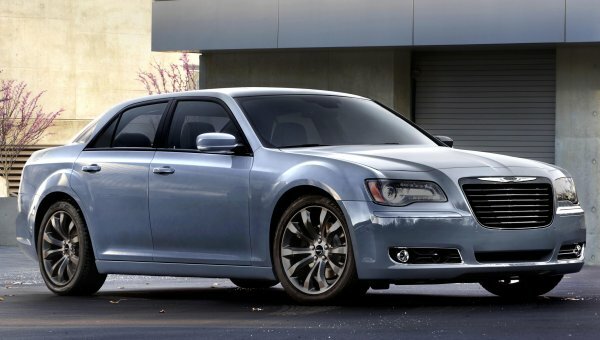 "Chrysler brand's S-models continue to be among the most sought after lineup of vehicles with their modern and athletic style – and for 2014, the new Chrysler 300S redefines 'S' for 'Stance,' with an even more imposing presence," said Al Gardner, President and CEO - Chrysler Brand, Chrysler Group LLC. "Adding to its legacy, including being crowned 'Best Chrysler in Decades' by a leading automotive consumer group, this new generation 300S is where world-class tailoring meets world-class quality, materials and technology. In addition to its standard, and almost iPad size, touchscreen display, Beats by Dre sound, available AWD, 20-inch black pocket wheels and Piano Black trims, the new Chrysler 300S now comes with exquisitely tailored dark blue leather seats. We call it Ambassador Blue. It's one more way to suit up our 'Imported from Detroit' Stance." On the outside, the 2014 Chrysler 300C gets a blacked out treatment that begins up front with a new Black Chrome grille surround and Black Chrome horizontal grille blades with a new “liquid chrome” Chrysler logo with the brand name embossed in black on the bright silver background. The 2014 300S also wears a Gloss Black belt molding along both sides of the car, black tinted tail lights, black tinted headlight lenses and Hyper Black wheels measuring 20 inches on the rear wheel drive models and 19 inches on the all wheel drive 300S. The 2014 S package is finished off with body colored door handles and fascia inserts while those who really want to show off their love of black trim can also opt for a Gloss Black painted roof. I love the look of the new 300S package and that black roof is a must-have in my opinion – especially when the car is ordered in the blue exterior paint shown here. On the inside, the 2014 Chrysler 300S features front power sport seats wrapped in the buyer’s choice of Black Nappa leather or a new Ambassador Blue Nappa leather layout with contrasting silver stitching. This black or Ambassador Blue leather treatment extends to the center console and the door mounted armrests while the instrument panel, steering wheel, gauge cluster and door panels are heavily clad in Piano Black for a very classy, upscale look. The 300S also comes standard with all sorts of high end goodies like the Chrysler UConnect infotainment system with an 8.4” touch screen and the ultra high performance Beats By Dre sound system that is as good as it gets in terms of factory equipped sound systems. There is also a set of paddle shifters that give the 300S a sportier feel while driving…and they look cool too. Like the 2013 models, the 2014 Chrysler 300S is available with either the 300 horsepower Pentastar V6 or the 370 horsepower Hemi V8. Both engines come with a standard 8-speed automatic transmission that helps make this large luxury sedan one of the most efficient options in the segment while also being among the most powerful.